Other than the Xbox, which is really designed as a games machine, this is the only streamer to include a DVD drive. The drive is locked to region 2, but it's an interesting addition and the Linksys Kiss 1600 upscales your DVDs to 720p and 1080i. Image quality is pretty good, although you may notice some artefacts if you look closely. One downside to the Kiss 1600 is that its menus are rather basic. In addition, the 802.11g wireless is going to struggle with HD content; our test clip would pause every so often, presumably as the stream buffer emptied. Still, you can attach an external hard drive to the USB port or even play HD files using the DVD drive. Let's face it, there's not a lot of HD content to be seen currently. 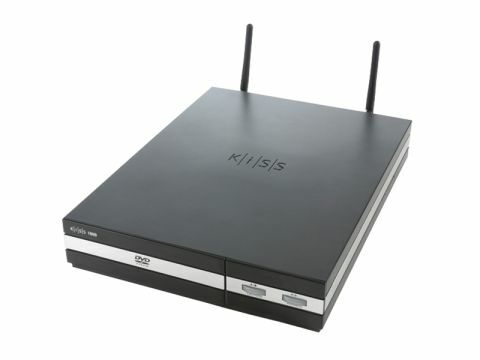 Although the Kiss 1600 is a UPnP device, it does need either its own PC Link software to be run on a PC, or use the media-sharing facility of Media Player 11. This means that you can't connect it to a NAS. The PC link software is easy to install and set up: you simply choose which files or folders you wish to share. This is just as well because no matter how we tried, we couldn't get it to detect our Media Player 11 shares. There's also no shuffle or repeat facility, nor is album art displayed. Furthermore, while it played back video without problems, pictures took around a second to draw on screen, which was painful to watch. The Kiss 1600 can also access a number of Internet services, currently covering simple games, local weather, news and Internet radio. The Kiss 1600's odd size means it won't fit with your other hi-fi components and although it's well-specced, it's just not one of the better devices out there.